The court denied plaintiff's motion to strike the 3,676 page report of defendant's invalidity expert as too long. "Plaintiff contends the report is too long to read and digest, and it obscures relevant issues by forcing [plaintiff] to expend an unreasonable amount of resources just to process it. . . . [Defendant] produced a comprehensive, detailed expert report. . . . Plaintiff did not move to strike the report until seven weeks later, on the night rebuttal reports were due. In its motion, Plaintiff does not state it cannot understand [the expert's] report. Nor does it claim the report is convoluted or lacking in substance, or that it is premised on technical or legal inaccuracies. . . . [A]lthough [the] report is lengthy, the size of the report alone does not make it improper warranting the Court to strike it. There are many complex issues involved, and the facts of this case require a detailed invalidity analysis. [Defendant] is required to present evidence of the invalidity of all 32 claims asserted against its customers as that issue will be included in the trials against the Supplier Defendants. . . . [Defendant] states Plaintiff has refused to reduce the scope of the overall dispute, and if Plaintiff would agree to this simplification, the report could be drastically reduced in size." The court granted in part defendant's motion for judgment as a matter of law as to plaintiff's abandoned claims. "[Defendant] presents an issue that has not been directly addressed by the Federal Circuit and upon which at least two district courts disagree. . . . [I]t would be fundamentally unfair and plain error for the Court to enter judgment against [plaintiff] on all of its abandoned claims because [plaintiff] was under Court order to narrow its claims to thirty-five. On the other hand, with regard to the thirty-five claims that [plaintiff] litigated, [defendant] is entitled to judgment on its counterclaim. . . . Although [plaintiff] withdrew or voluntarily dismissed all but five claims, [defendant] did not amend its counterclaim [for declaratory judgment of non-infringement] to correspond to [plaintiff's] dismissals. Therefore, the Court concludes that [defendant] is entitled to judgment on the thirty claims that the Court allowed [plaintiff] to pursue through trial, but failed to offer evidence on at trial." The Board granted institution of covered business method review of an IP rights management patent, finding the patent was directed to a financial product or service. "[T]he [challenged] patent states that the invention provides an integrated rights management and licensing system and method involving the buying, and selling of intellectual property rights. . . . Patent Owner contends that none of the challenged claims expressly recites a method or apparatus for performing data processing or other operations used in the practice, administration or management of a financial product or service. We do not interpret the statute as requiring the literal recitation of the terms data processing of financial products or services. . . . The suggestion to adopt a definition limiting financial services or products to a particular industry, financial services industry, was considered but not adopted during rulemaking as the statute does not limit the program expressly to financial institutions, and such a narrow construction of the statute would be contrary to the legislative history of Section 18. . . . [T]he [challenged] patent claims systems and methods that are directed to a financial activity—buying and selling intellectual property rights—that constitutes a financial product or service under § 18(d)(1)." Is the PTAB more likely to institute an IPR if the district court stays concurrent litigation? A Docket Navigator subscriber recently asked us this question so we decided to investigate. As it turns out, there appears to be some correlation between a district court’s decision to stay a case pending IPR and the outcome of the PTAB’s institution decision. Click here to view a summary of our findings. The court denied defendant's motion to reopen the judgment and rejected its argument that Teva Pharmaceuticals USA, Inc. v. Sandoz, Inc., 135 S.Ct. 831 (2015), invalidated the Federal Circuit's claim construction in a prior appeal in this action. "[Defendant] argues that under Teva’s new approach, the claim construction of 'lodging the member' issued by the Federal Circuit on appeal is not valid, but rather the construction previously issued by this Court should be reinstated. [Defendant] argues that this Court engaged in fact-finding to arrive at its construction and the Federal Circuit therefore should have honored that construction unless it found clear error in this Court’s fact-finding. . . . Nothing in Teva suggests that the Federal Circuit must review immaterial or improper fact-finding under a clear error standard. Rather it appears rather clearly that such fact-finding is to be disregarded and a de novo standard applied." In this interactive webinar, users will learn how to find the answers to a list of questions that came up in the recent PTAB IP Counsel Exchange in San Jose, using Docket Navigator. Participants will gain practical knowledge about how to find PTAB information based on real data, removing the need to “guess” how the Board is interpreting current legal issues. What are the success rates of stays pending IPR or CBM in the district courts? Are stays more or less likely in “experienced” patent courts? How can I find PTAB decisions interpreting real parties-in-interest? How many patents have been cancelled by the new PTAB proceedings? How many times has unpatentable subject matter (USC §101) been granted (or denied) as a ground for trial in the PTAB? What district court cases have relied on the issue of unpatentable subject matter (USC §101) as a basis for a decision? The “take away” after the webinar will be the full list of the questions that were addressed, including live links to the search results for each question. When a link is clicked on, the answers will be updated in real-time. Free passwords to Docket Navigator are available to all in-house counsel participants upon request. Time will be reserved for Q&A at the conclusion of the panel. The court granted defendant's motion to amend its pleadings to include a claim for inequitable conduct based on plaintiff's failure to disclose IPR proceedings in a related patent during reexamination of the patents-in-suit. 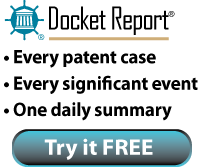 "[Defendant] has cited legal support for its argument that the failure to disclose the PTAB’s decision to grant IPR of the [related] patent could be a material omission because the patents are closely related. And, given [defendant's] allegations that the same actors were involved in all of the relevant proceedings and regarding the temporal proximity between the PTAB’s decision and further communications with the PTO in the reexaminations, sufficient facts are alleged from which the fact-finder could reasonably infer that the omission was intentional." The court granted plaintiff's motion in limine to preclude evidence of the institution of inter partes review. "There is no claim that any relevant final decision has been made. Any probative value in the fact that [defendant] has chosen to take advantage of other avenues and forums is substantially outweighed by the danger of misleading the jury and [a] waste of time involved in explaining to the jury what is involved in such proceedings and the natural counterclaim that that such proceedings are Defendants’ attempt to vexatiously delay and multiply proceedings and impose costs on Plaintiff." The court denied plaintiff's motion for a preliminary injunction prohibiting the sale of defendant's oil cooler kits because there was a substantial question of enforceability of the patent-in-suit in light of a pending reissue application. "Defendant directed the Court to Plaintiff’s application for a reissue patent for the [patent] to rebut the presumption that the [patent-in-suit] is valid. . . . Plaintiff may be correct that the reissue patent application does not address whether the [patent] is invalid for obviousness or indefiniteness, but the purpose of a reissue patent application is to correct a patent 'wholly or partially inoperative or invalid.'. . . It is true that the original patent remains in effect until it is reissued; however, whether a patent remains in force is different from whether there is a substantial question concerning the enforceability the [patent]." Despite finding attorney misconduct, the court denied defendant's motion for a new trial and rejected the argument that plaintiff tainted the jury verdict by discussing the results of another case involving one of the patents-in-suit. "[Plaintiff] told the jury that: (1) another jury found the [patent] valid; (2) the Federal Circuit affirmed that verdict; and (3) as a result, [a third party] paid over $500 million dollars to [plaintiff]. . . . [T]he Court first concludes that there was 'attorney misconduct' in the sense that there were multiple violations of the Court's orders regarding the proper and improper uses of facts about the [other case]. These violations were committed by [plaintiff's] lead counsel . . . The Court's efforts to ensure a fair trial to both sides were made all the more difficult by [plaintiff's lead counsel's] decision to walk up to the line the Court had drawn and, several times, step right over it. . . . The Court finds that it is not reasonably probable that [lead counsel's] conduct with respect to the [prior case] influenced the jury's verdict. The Court reaches this conclusion based primarily on the strength of the evidence presented by [plaintiff]. After all, this was a case in which the undisputed damages evidence was that an entire industry -- other than [defendant] and one Chinese company -- took licenses from [plaintiff] for innovative technology that saved thousands of lives and billions of dollars in healthcare costs." The court denied defendant's motion in limine to preclude plaintiffs from comparing defendant's reasonable royalty calculation to the fees defendant incurred for litigation counsel and expert witnesses. "Plaintiffs argue that the amounts of money Defendant was willing to pay its expert witness and its counsel are relevant to the value that Defendant attaches to the subject matter of the Patents-in-Suit and its [accused] System and, thus, are relevant to the calculation of a reasonable royalty. . . . The Court finds that the challenged evidence is relevant to the value the alleged infringer places on the ability 'to obtain a license to manufacture and sell a particular article embodying the patented invention,' as stated in Georgia-Pacific factor fifteen. . . . [P]ost-hypothetical negotiation information regarding the amount of money spent to investigate and defend the ability to continue to market the accused product without obtaining a license is relevant to the calculation of a reasonable royalty and may be presented to the jury." To date, U.S. district courts have decided 140 motions to stay pending IPR in 2015. Eight-seven of those motions were granted, resulting in a success rate of 62%. In 2014 the success rate was 56% and in 2013 the success rate was 60% nationwide. To view a Motion Success Report showing success rates over time, click here. You may use the filters in the left margin to focus the report on a particular court, judge, etc. The court granted defendant's post-trial renewed motion to stay pending inter partes review following a $44 million jury verdict because the PTAB invalidated all but one of plaintiff's asserted claims while post-trial motions were pending. "This case is at a very late stage of litigation. A jury has found the patents-in-suit to be valid, determined that defendants infringed all of the claims at issue and awarded plaintiffs damages. . . . Resolving [14 post-verdict] motions would require a ruling on almost every contested issue in this case, including infringement, invalidity and damages. Because all but one of the claims-in-suit are addressed in the recent decisions issued by the [PTAB] and the remaining claim is the subject of inter partes review, a stay would provide important guidance from the patent office, simplify the case, avoid a needless waste of judicial resources and prevent inconsistent results between the inter partes review and this litigation. . . . [E]ven if I did not stay the litigation, the judgment in this case and the board’s inter partes review decisions would be on appeal in the Court of Appeals for the Federal Circuit at approximately the same time. As long as any portion of this case remained open at the time the court of appeals ruled on the board’s final decisions (which is highly likely given the timing of the appeals processes), cancellation of the patent claims would moot plaintiffs’ infringement claims." The special master recommended granting plaintiff's motion for summary judgment that its XML document manipulation patent was not invalid for lack of patentable subject matter because it was not directed to an abstract idea. "[Defendant's] characterization of the claims as merely representing something as generic and broad as 'data storage' and its analogy of the patent to activities performed by a 'human translator' or something that can be achieved through use of a pen and paper, is excessively detached from the specificity and plain language of the claimed invention, and the overall intrinsic evidence pertaining to the patent. . . . The [patent-in-suit] is directed to an apparatus utilizing a specific method for dynamically retrieving, manipulating, updating, creating, and displaying data from different types of XML documents – documents that contain a very specialized, computer language and can differ significantly from business to business in terms of formats and syntax. Significantly, the 'apparatus' . . . as explained in the Specification, uses a structure that goes beyond relational databases and mere document sets. . . . [S]oftware-based patents in particular, such as this one, require a more close, and focused lens, or else the cautionary tale set forth by the Supreme Court in Alice, where the 'abstract idea' exception swallows the broad statutory language of Section 101, may in fact come to a fruition." How Has the PTAB Interpreted “Financial Product or Service”? Under AIA § 18(d)(1), a covered business method patent “claims a method or corresponding apparatus for performing data processing or other operations used in the practice, administration, or management of a financial product or service . . .” The PTAB has addressed the question of whether a challenged patent meets this requirement over 200 times. To view summaries of those decisions with links to the underlying decisions, click here. If you’d like to be alerted the next time the PTAB addresses this issue, click “create alert” at the bottom of the page after viewing the summaries. In granting institution of covered business method review of a database security system patent on § 101 grounds, the Board found that the patent was directed to a financial product or service. "Patent Owner states that Petitioner does not cite to 'any single word in any single claim' that is directed to a financial product of service, none of the prior art cited by Petitioner is directed to a financial product or service, and Petitioner does not cite any examples of actual financial products that employ the method of the claims.' . . . The Specification discloses that protection attributes are used to protect against unauthorized access of a data portion in a database and that banking is a field where protection against unauthorized access to databases that are used for administering and storing sensitive information is desired. . . . Banking is a financial activity. . . . [W]e determine that Petitioner establishes that at least claim 1 recites a method or corresponding apparatus for performing data processing or other operations used in the practice, administration, or management of a financial product or service." The court granted defendant's motion for judgment on the pleadings that plaintiff's information access authorization patent was invalid for lack of patentable subject matter and found that the patent was directed to an abstract idea. "The wording of the claim appears to present a complex method that uses attributes, rules, connectors, classifications, and remote data sources. But, upon closer examination, the gist of the claim involves a user entering a request for access, looking up the rule for access, determining what information is needed to apply the rule, obtaining that information, and then applying the information to the rule to make a decision. This is an abstract idea. The abstract idea being that people who meet certain requirements are allowed to do certain things. . . . Even if the system is faster and more efficient than what was done in the past, that fact does not make this not an abstract idea." The Board declined to institute inter partes review of an image capturing patent because the asserted basis for unpatentability required the Board to determine that the challenged patent was not entitled to the benefit of a parent application's filing date due to lack of co-pendency and such determination would constitute a collateral attack on an earlier determination by the PTO in a revival action. "Had [the petitioner's] argument been that the parent . . . application does not support the subject matter of the challenged claims . . . [the patent owner] would have to show that the challenged claims are entitled to the earlier effective filing date of the parent . . . application. Here, however, [the petitioner] asserts only lack of co-pendency . . . . Moreover, [the petitioner] asserts lack of co-pendency in a manner that amounts to a collateral attack on a petition decision . . . regarding the status of the parent . . . application. . . . [The petitioner] has not identified proper jurisdiction or authority of the Board either (1) to review and overturn the [decision of the PTO] on the Petition to Revive [the parent application], or (2) to ignore that decision and make our own determination on whether the parent . . . application should have been revived on the basis of 'unintentional' abandonment. . . . Where the issue is the status of an applied reference as prior art, viewed in light of a patent owner’s effort to antedate the date of the reference . . . we can review the evidence submitted to show a date of invention prior to the date of the reference. That issue is substantive and central to the merit of the patentability determination. On the other hand, where the issue is the status of an application as abandoned or revived, the matter is procedural and not central to the substantive merit of a patentability determination. We have jurisdiction to review and determine the former, not the latter. Furthermore, we note also that 'PTO revival actions are not subject to third party challenge under the APA.'" The court granted defendant's motion for summary judgment that plaintiff's royalty apportionment theory was invalid under the entire market value rule and rejected plaintiff's argument that it didn't need to apportion the revenue base because it made a downward adjustment to the royalty rate. "[Plaintiff] argues that [revenue base apportionment] is unnecessary because the royalty rate has been adjusted downward to account for the multicomponent nature of the accused products. . . . [Plaintiff's] argument hinges on an incorrect reading of Ericsson, Inc. v. D-Link Systems, 773 F.3d 1201 (Fed. Cir. 2014). There, the Federal Circuit made clear that a royalty-rate-only apportionment approach is typically barred with respect to multi-component products unless the entire value of the accused products is attributable to the patented feature. . . . [T]he opinion carefully explains that this legal rule is limited by 'an important evidentiary principle.'. . . '[W]here the entire value of a machine as a marketable article is properly and legally attributable to the patented feature, the damages owed to the patentee may be calculated by reference to that value. Where it is not, however, courts must insist on a more realistic starting point for the royalty calculations by juries —often, the smallest salable unit and, at times, even less.'" Following remand, the court granted in part defendants' motion for Rule 11 sanctions and sanctioned plaintiff's counsel $450,000, calculated from a disgorgement of counsel's profits plus 50%. "If the worst result that one could expect when filing a frivolous lawsuit is that one might not profit from the venture, then one is not deterred from attempting the pursuit. A disgorgement sanction alone has no greater deterrent effect than the risk that any plaintiff’s attorney takes when embarking on a non-frivolous case under a pure contingency fee arrangement. . . . The Court recognizes that although this sanction is relatively severe by typical Rule 11 standards, the sanction amounts to significantly less than the approximately $1.4 million in fees and expenses requested and incurred by Defendants in this case." The court denied defendant's motion for judgment on the pleadings of invalidity for lack of patentable subject matter because defendant failed to raise that invalidity ground in its invalidity contentions and rejected defendant's argument that patentability was a threshold issue similar to jurisdiction. "At first glance . . . [plaintiffs] would appear to be the owner of two patents worth little more than the paper they are printed on. There’s just one thing — [defendant] never told [plaintiffs] about any Section 101 problem. In this district, the rules are clear: a party opposing a claim of patent infringement must include in its invalidity contentions '[a]ny grounds of invalidity based on 35 U.S.C. § 101.' Invalidity grounds not disclosed 'are barred.' . . . [W]hile appellate courts have likened patent eligibility to jurisdiction, the focus of such comments are plainly on timing — that is, when Section 101 should be considered. They do not suggest that eligibility implicates Article III authority such that the issue is always subject to court review. . . . Maybe things would be different if at some point [defendant] had sought leave to amend its invalidity contentions. Then, perhaps, [defendant's] diligence and the prejudice to [plaintiffs] would matter more. But no such leave was sought, discovery is complete and trial is now just two months away. In sum, even at the cost of proceeding with patents that may have issues under Section 101, this court must hold parties to their failure to disclose contentions. This district's patent rules only work if there are consequences for failing to comply." The Board declined to institute inter partes review of a telephone communications patent as anticipated because the petition did not show how the asserted reference was prior art to the challenged claims under 35 U.S.C. § 102(e). "[The patent cited as prior art] is prior art only to the extent that its content is supported by disclosure of [a provisional application] in a manner that complies with 35 U.S.C. § 112, first paragraph. . . . [The] Petitioner’s analysis of its challenge against claims 1–23 relies solely on the disclosure of [the reference], without explaining how the specific disclosures it relies upon are supported by the [earlier provisional] application. . . . When the qualification of a reference as prior art depends on the existence of adequate support in another reference, this mandate requires that Petitioner explain where such support for its challenge can be found. . . . Because Petitioner fails to demonstrate that all parts of [the patent cited as prior art] relied on for its challenge to claims 1–23 are prior art to the [challenged patent], we conclude that Petitioner has not demonstrated a reasonable likelihood of prevailing on that challenge." The Board declined to institute inter partes review of a patent claiming a spinal stabilization device on obviousness grounds because the petition failed to establish that an asserted reference was prior art under 35 U.S.C. § 102(e). "[T]he effective date of [the asserted patent] as prior art under § 102(e) is the date on which an application in [the patent's] priority chain was filed that discloses the information relied upon to prove unpatentability of the challenged claims. [The petitioner] neither analyzes whether the [earlier provisional application] discloses the subject matter recited in the challenged claims nor provides a copy of the [provisional application] for the record in this proceeding. . . . [F]or purposes of this decision, we accord June 23, 2005, the filing date of the application that issued as [the asserted patent], rather than the earlier filing date of the provisional application to which [the patent] claims priority . . . . Because, on the current record, the priority of the challenged claims predates June 23, 2005, [the petitioner] has failed to establish that [the asserted patent] is prior art to the challenged claims." The PTAB has issued twenty-six final written decisions addressing unpatentability challenges under § 101. In every decision, the challenged claims were deemed unpatentable. To view summaries of the decisions click here. In a final written decision, the Board found the challenged claims of a data acquisition patent upatentable under § 101 and rejected the patent owner's argument that data encryption and check imaging and scanning were not abstract ideas. "Patent Owner [argues] . . . that a general recitation of encryption renders the claims patent eligible and that encryption is not an abstract idea. . . . [T]he basic concept of encryption is ubiquitous. Encryption, in general, represents a basic building block of human ingenuity that has been used for hundreds, if not thousands, of years. Like hedging, encryption in its simplest form does not require the use of technology to communicate secure messages. Specifically, encryption, in its simplest form, could be performed with pencil and paper. . . . According to Patent Owner, '[i]maging or scanning a check or other financial document is a routine practice in the business of banking/financial matters' and that routine practices are not abstract. . . . The fact that a business practice is used widely does not preclude a determination that the underlying practice involves an abstract idea. . . . Patent Owner [also] contends that imaging or scanning a check is not an abstract idea because documents and receipts are concrete objects. The fact that a claim recites substantial physical limitations does not preclude a determination that the claim is effectively an unpatentable law of nature or an attempt to preempt an abstract idea." The court granted defendant's motion for summary judgment that plaintiff's network security patents were invalid for lack of patentable subject matter and found that the patents lacked an inventive concept. "[Plaintiff] argues that 'programming creates a new machine, because a general purpose computer in effect becomes a special purpose computer once it is programmed to perform particular functions pursuant to instructions from program software.'. . . The [patent-in-suit] is not limited to a specific computer program or configuration. Rather, it broadly claims any network filtering program that bases the application of an access rule on two or more sources of packetized data. All software patents, whether drawn to an abstract idea or not, require implementation by way of a computer program. [Plaintiff's] argument would result in the validation of all software patents, whether drawn to an abstract idea or not. This it cannot do."